Coupes invariably cost more and provide less than the practical saloons and hatchbacks on which they are based. The compensation is style, beauty and a more sporty image. But although they have had spells of popularity in Japan and the United States, coupe versions of everyday cars haven't sold very well in Europe and the recent trend is simply to give the name to the three-door hatchback variant. We all know that Hyundai is ambitious and expanding when other car makers are contracting. A while back, when it saw that cars like the Toyota Celica, Nissan 200SX, and Rover 200 Coupe were disappearing from the market, it continued to develop its own front-wheel drive coupe, known in America as the Tiburon. This was one of the first cars to show that Hyundai was capable of real design flair and, with a 2.7-litre V6 engine for America, was a credible performance car at a reasonable price. Its next move was up-market, with the rear-wheel drive Genesis Coupe from its new premium sub-brand, again primarily for America. There was a longer wait for a replacement for the smaller and cheaper front-wheel drive coupe, though Hyundai made it known that the radically-styled Veloster concept car was the shape of things to come. And so it was, appearing last year in production form, less extreme, but still with some challenging design features. Let's dwell on the Veloster's styling for a moment. The front follows the rather fussy, big lights and grille, identity of other recent Hyundais but the side profile, with the roofline sloping in a straight line from the top of the windscreen, is just plain weird. As a result, the back is so low that the rear window is divided between a slot in the tailgate and a large glazed section of the roof. And with small rear side windows and the bodywork forming wide C-pillars, it is not surprising that the driver's view backward is seriously limited. There's more: the special aspect of the Veloster is its asymmetrical doors, two on one side and one on the other. This way of providing easier access to a tight rear compartment is not unique  the 2002 Saturn Ion coupe in the US and the current Mini Clubman have similar arrangements  but Hyundai is more thorough, for unlike Mini, it installs the two doors on the passenger (kerb) side whether left- or right-hand drive. Although you can see the shut-lines, the third side door is well disguised, with its handle concealed within the window frame. In theory this '3+1' door arrangement is very convenient but in the Veloster you have to wonder if it is really worthwhile. Entry and exit through the small, front-hinged extra door isn't much easier than clambering past a folded front seat. 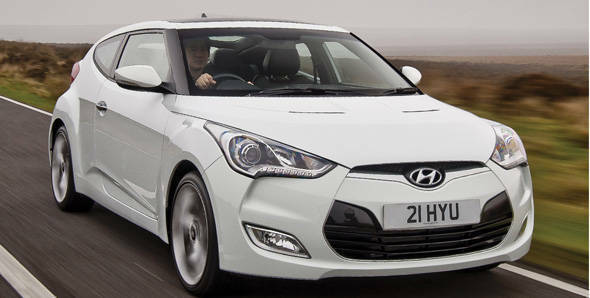 Love it or hate it, the Veloster is distinctive but far from beautiful in any conventional sense. Fortunately, the driving is better than the looks may suggest. Mechanically, it is pretty standard hatchback stuff, with MacPherson strut front suspension and a torsion beam at the rear at the front, disc brakes all round and electric power steering. The 1.6-litre 16-valve four-cylinder engine has direct fuel injection  unusual without turbocharging  and comes with either a six-speed manual or Hyundai's first dual-clutch semi-automatic transmission. We drove a six-speed manual. The standard engine produces 140PS but a turbocharged version launched in the US at the end of last year is boosted to 204PS. The naturally-aspirated model is set up more for fuel economy than sporty performance  it only just breaks 10 seconds for 0-100kmph - but in most conditions the engine feels adequately powerful. The steering, which is disconcertingly light at low speeds around straight-ahead, weights up as you go faster, and ride and handling are both better than the average standard hatchback. The ride is firmer than most, helping the sense of control. In extremis, the Veloster can be found wanting but for everyday motoring it's OK, showing that in this area too, Hyundai is making big improvements. Inside, the design and execution of the facia and instrument panel follows the improvements  much praised  of the Sonata/i40. That said, there are still quite a lot of hard plastic mouldings which give the simpler trim versions a slightly cheap feel. Our UK Sport version had red leather seating to brighten the gloom in the cabin and snazzy 18 inch alloy wheels with colour inserts to give a smarter outward appearance. The Veloster continues Hyundai's reputation for well-built, good value-for-money cars. Whether its bid to be different from the normal run of coupes brings real advantages is arguable. The old axiom of 'less for more' still applies but not everyone will agree that, in this case, it is adequately compensated by style and beauty.